Whether you wish to increase the loading capacity, to improve the manoeuvrability or to adapt the truck to the body, we have a solution for you. With this adjustment you can make every turn and drive anywhere you want, even in crowded cities with narrow streets. The rear axle of the vehicle is replaced by an electro-hydraulically steered axle. This allows for four-wheel steering, so that you can drive in all directions. For example, the rear wheels can be steered in the same direction as the front wheels so that the vehicle moves diagonally. In addition, it is also possible to steer in opposite directions, resulting in an extra short turning circle. It is also possible to operate the rear axle manually. In short, this is a very flexible solution which is ideal for fire and rescue vehicles. 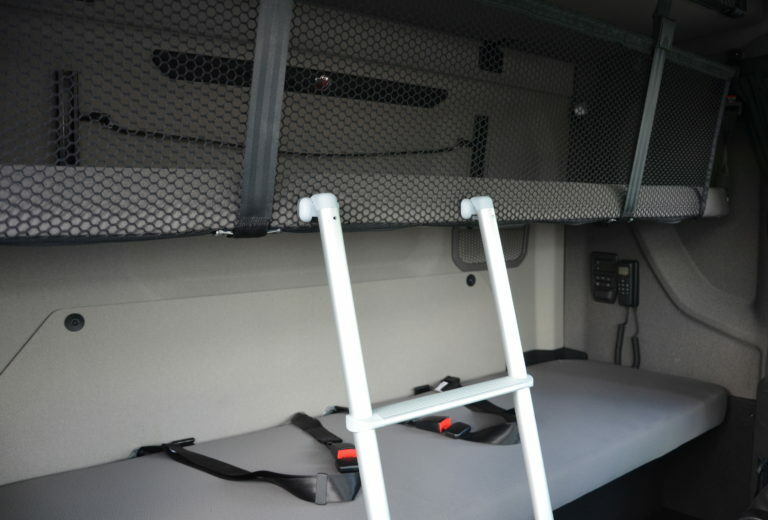 You get an extremely manoeuvrable and narrow truck without giving in on loading capacity. With this modification, we mount a completely new and narrow front axle. In addition, we adapt various components such as the footboards, mudguards and mirrors to make the entire vehicle narrower. The perfect solution for transport in inner cities. The base vehicle for this adjustment is a tractor with a steered tag axle. This tag axle is converted into a pusher axle. The fact that original parts can be used, forms a huge advantage. Also, by it being a conversion, nothing changes on the functional side, meaning that the axle behaves as it was originally conceived and developed by the manufacturer. In addition, a vehicle with this adjustment can easily be serviced by the dealer. The most obvious application is municipal & waste trucks. However, this axle can be used on all vehicles where optimal axle load distribution is required, thus, for example, also on a truck with a hook loader system. A combination of moving an axle and moving components. Sometimes the ideal chassis configuration is not available directly ex-factory. We then are eager to optimise the chassis layout of the truck for you. With this specific solution we move the second pusher axle backwards to create space for the exhaust muffler. The latter is placed between axles 1 and 2, resulting in a lot of free space on the chassis behind axle 2. This solution is ideal when the bodybuilder requires this space for the installation of the truck body.